The Gentlemen Baristas opened at the end of 2014 and is favoured by such luminaries as Bex (Double Skinny Macchiato) and Daniel (Cups of Coffee London). So quite why it’s taken me over two years to visit the original coffee shop on Union Street is a mystery. And, frankly, the loss is all mine. From the street, a modest multi-paned square window next to a solitary door hides an unexpectedly large and glorious interior, consisting of several interlinked spaces spread over two floors, including a sheltered roof-garden and cosy back room. I can see the appeal already. The Gentlemen Baristas projects a fun image, reminding me of Victoriana and, more specifically, Steampunk, but not in an in-your-face sort of way. If you’re just coming for a cup of coffee, don’t let it put you off. Talking of which, while The Gentlemen Baristas may be about fun, it’s very serious when it comes to the coffee, which is private-label roasted by Wogan Coffee in Bristol under The Gentlemen Baristas brand. There are several blends and single-origins available on espresso, with more single-origins on filter (Aeropress, V60, Kalita Wave and Chemex), where they’re joined by a guest roaster, currently Liverpool’s Neighbourhood Coffee. August 2018: The Gentlemen Baristas now only serves single-origins, which are roasted under the Gentlemen Baristas brand by either Wogan Coffee or Neighbourhood Coffee. Not content with waiting for two years to visit, I then visited twice in the space of a month. The first occasion, on a rainy December evening (when The Gentlemen Baristas was ironically staffed by three excellent lady baristas), was followed by a daytime visit at the start of January. However, I was lured there under false pretences. You see, The Gentlemen Baristas has recently opened a second branch in the Building Centre on Store Street. As a result, the training room, currently upstairs at Union Street, is moving to the new branch, leading to The Gentlemen Baristas closing over the Christmas break for a refurbishment. This, in turn, rendered my photos obsolete, necessitating a return in the New Year for a re-shoot. So I re-visited a lovely coffee shop and drank its lovely coffee for no good reason. The tragedy! The Gentleman Baristas appears to be a pretty small spot, just a round, three-person table in the window to the right of the door, with the counter down the left-hand side of a long, thin space. However, look a little closer: there’s more to The Gentleman Baristas than meets the eye. For starters, an opening in the back wall beyond the counter leads to a cosy back room with four tables and a four-person bar against the back wall. There’s very little natural light here, but this is more than made up for by four bright light bulbs, which go well with the exposed brick walls, wooden floor and white-painted ceiling. However, that’s not all. Two doors pierce the white-plastered wall opposite the counter. One leads, unexcitingly, to the toilet, but the first, towards the front, leads to a flight of stairs which runs up the right-hand side to the first floor. Right now, the espresso machines and grinders that equipped the training room are still there, but they’ll soon be leaving and upstairs will be recast as more of an informal dining area. Until then, there’s a large, communal table, flanked by an armchair (front) and sofa (back), with another table right at the front, where you can sit by either of two square windows and watch the world go by. Most would be content with this, but not The Gentlemen Baristas. Oh no. There’s a glass door at the back, opening onto a secluded, sheltered roof-garden. Right now, there’s a bench running around three sides with two large, round tables, but this too is being refurbished. Oh well, I guess I’ll have to go back a THIRD time. Turning to the coffee, The Gentlemen Baristas has four options on espresso: house-blend, decaf and (usually) two single-origins, one of which is a sometimes a guest. There are four single-origins on pour-over, including a couple of guests, one of which was The Gatsby, a single-origin coffee infused with Bourbon which I tried (and loved) at the London Coffee Festival. 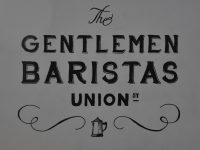 December 2017: The Gentlemen Baristas, Union Street was a runner-up for the 2017 Happiest Staff Award. This entry was posted in Cafes, Cake, Coffee Gardens, Laptop Friendly, Sandwiches, South East London and tagged include, Neighbourhood, Wogan by Brian Williams. Bookmark the permalink.